A 74 yo ♀ presents to the ED, where you are the physician on call. She is concerned about sudden vision loss in her left eye. Oh, well, it all started about 4 hours ago. Is something terrible happening? Am I going to go blind? Oh, no! I’ve never had anything like this before. I’m really quite worried! Well, I have been having this headache for the past 2 weeks. It’s kind of annoying. No, thankfully I don’t have any eye pain. Just headaches. No, I’ve always been very healthy. My doctor did say I had high cholesterol, but once I started that tablet, it got better. No, I haven’t had any accidents or falls recently. I try to stay away from dangerous situations since I broke my hip 3 years ago. Not that I know of. My father had cataracts, but he was older – about my age now, when he got them. A 74 yo ♀ presents to the ED, where you are the physician on call. She is concerned about sudden vision loss in her left eye. She states that the episode occurred about 4 hours ago. She has had no symptoms in the right eye. There is no eye pain, but she notes that she has been having headaches for the past 2 weeks. What is your differential diagnosis? Pick your top four choices. Incorrect: Angle closure glaucoma presents with constant pain +/- vomiting, nausea, and abdominal cramps. Correct: Central retinal artery occlusion is associated with sudden painless loss of vision. Associated risk factors include hypertension, hypercholesterolemia, diabetes, vascular disease, prior MI, transient ischemic attacks, and stroke. Correct: As the name suggests, transient monocular vision loss causes sudden painless loss of vision. This may be benign in a person younger than 45 years old. Incorrect: Cataracts are typically slow growing. Correct: Giant cell arteritis classically presents in an older person with sudden permanent or transient visual loss. Associated symptoms often include headache, jaw claudication, scalp pain, and polymyalgia rheumatica. Incorrect: Herpes simplex keratitis causes a superficial infection of the cornea, often in a dendritic pattern. Symptoms include red eye, photophobia, and some degree of eye irritation. Incorrect: Pseudotumor cerebri classically occurs in young obese females, and produces bilateral visual changes due to increased intracranial pressure. Visual field is usually affected late in disease. Associated with headache worse on lying down and relieved by standing. 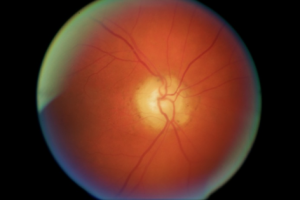 Correct: Central retinal vein occlusion can present with sudden painless loss of vision. Risk factors include hypertension, diabetes, cardiovascular disease, and hyperviscosity states such as polycythemia. You examined this patient’s eyes using a direct ophthalmoscope. The right eye was completely normal to examination. The left eye is pictured below. What is the most likely diagnosis? Match the fundoscopic change to the pathological condition. Incorrect: Central retinal artery occlusion has the classic findings of a pale, swollen optic disk, a pale retina with prominent ‘cherry red’ macula. Incorrect: The optic disk seen in this patient’s eye is pale and edematous, which is consistent with ischemic optic neuropathy. Incorrect: Central retinal vein occlusion has the classic findings of retinal hemorrhages, dilated torturous retinal veins, cotton wool spots and retinal and macular edema. Classically described as a ‘blood and thunder’ or ‘stormy sky’ appearance. Correct: The optic disk seen in this patient’s eye is pale and edematous, which is consistent with ischemic optic neuropathy. Incorrect: The retina in this patient is all in one plane with no signs of detachment. You suspect she has giant cell arteritis based on her associated headaches which were located in the temporal region on both sides. Which other symptoms would you expect her to have if she did? Correct: The finding (polymyalgia rheumatica) describes proximal muscle weakness, and occurs in 40-50% of patients with GCA. Incorrect: Malar rash is not a common finding in GCA. If a malar rash was present, a diagnosis of systemic lupus erythematosus would have to be entertained. Incorrect: Alopecia is not a common finding in GCA. It is also a fairly non-specific finding. Correct: Jaw claudication is present in 50% of patients with GCA. This may be present with weight loss, or the patient complaining about not being able to chew steaks any more. Incorrect: Xerostomia (dry mouth) and keratoconjunctivitis sicca (dry eyes) are not commonly associated with GCA. They are however found together in Sjogren’s syndrome. What diagnostic tests would confirm a diagnosis of giant cell arteritis? Incorrect: ANA is positive in many automimmune conditions, including systemic lupus erythematosus, but not in GCA. Correct: Temporal artery biopsy is the gold standard for diagnosis of GCA. Sample needs to be ≥ 2 cm in length. Correct: CRP is usually elevated in inflammatory processes, including GCA. Correct: Platelets can commonly be elevated in cases of giant cell arteritis. Correct: ESR is usually quite elevated in cases of GCA, often >70 mm/hr. Incorrect: ANCA is useful for the diagnosis of small and medium vessel vasculitides, but has no role in the diagnosis of GCA. In the ED, her ESR and CRP come back elevated at 100 mm/hr and 12 ng/mL respectively. Temporal artery biopsy is not available for the next two days as your surgeon is on vacation. Incorrect: For suspected GCA, the standard of care is to start high dose steroids (usually prednisone) immediately. Temporal artery biopsy will not be altered by steroid use for up to 7-10 days. Incorrect: There is no role for antibiotics in the treatment of GCA as there is no infection. Correct: For suspected GCA, the standard of care is to start high dose steroids (usually prednisone) immediately. Temporal artery biopsy will not be altered by steroid use for up to 7-10 days. Incorrect: For treatment of GCA, high dose prednisone (40-60 mg/day) is the treatment of choice. Giant cell arteritis (GCA) is a granulomatous vasculitis of medium sized blood vessels. It occurs most commonly in females than males with a ratio of about 3:1, and occurs most commonly at around age 70. Symptoms include headache and scalp tenderness, usually in the temporal region, jaw claudication, amaurosis fugax (transient monocular loss of vision in one eye), and polymyalgia rheumatica (weakness in proximal muscle groups of upper and lower limbs). The gold standard for diagnosis is temporal artery biopsy (need at least 3 cm sample). Histology reveals non-caseating granulomas in the vessel walls. Lesions are not continuous, so a negative biopsy does not guarantee that disease is not present. Other lab tests include markedly elevated ESR and CRP, along with mildly elevated alkaline phosphatase and platelets. Treatment should be started immediately as the possible sequelae of untreated GCA include irreversible monocular blindness secondary to ischemic optic neuropathy. High dose prednisone (40-60 mg prednisone daily) should be started immediately, and the results of the temporal artery biopsy will not be affected for the first three days of therapy.